WORCESTER, Mass. - The Holy Cross women's hockey team dropped a nail-biter, 2-1, to Vermont Sunday afternoon at the Hart Center. Down 2-0 with five minutes to play in the third period, the Crusaders cut the lead in half when Danielle Doherty scored her first goal of the season to cut the Catamounts' lead in half on a 5-on-3 opportunity. Despite applying pressure for the remainder of the period, Holy Cross could not add a second to tie things up. Shots were even at 23 and Jada Brenon made 21 saves on the day for the Crusaders. 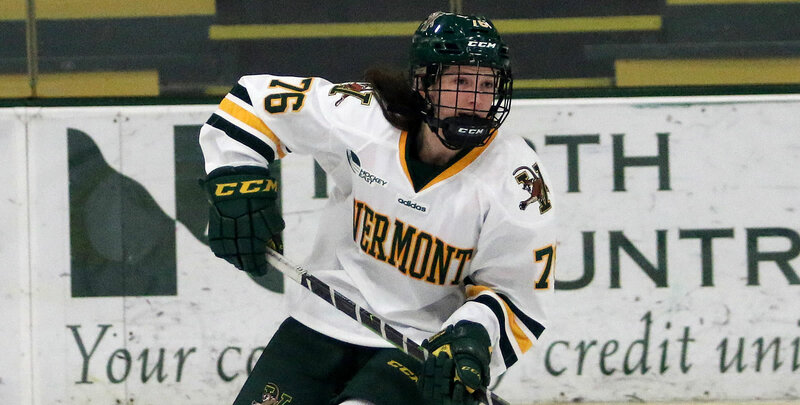 1-0 UVM (1st, 6:54, PP): Vermont struck first thanks to Alyssa Gorecki who got some help from Maude Poulin-Labelle. 2-0 UVM (1st, 18:33, EV): The Catamounts added a second in the period when Poulin-Labelle had her shot from the point blocked, but quickly got the rebound and fired it home to increase the lead to two. 2-1 HC (3rd, 15:27, PP): Victoria Young's shot hit the boards behind the goal and ricocheted out to Emma Lange. Lange sent a shot of her own on goal that trickled through the crease to a waiting Doherty at the back post who made sure it found the back of the net. The Crusaders will play a single game next weekend at Boston University on Saturday, Feb. 9 at 3 p.m for the third and final Turnpike Trophy game of the year. In two weeks, Holy Cross will travel to Vermont for a pair of games to finish the season series.